... and here's a photo with the flash. I think I prefer without, but that glitter can be mighty persnickety to photograph well. Incidentally, I realize my blog postings have been very heavy on the received and lacking on the sent, so I'm trying to even that out. Where do you get that awesome glitter spray? haha I love it to pieces, <3. And the fairy stamp is so cute. L - the glitter spray is called Glimmer Mist and you can find out more about it at that link. I got mine on eBay - sometimes prices are very good from the craft shops there. I LOVE the stuff - I have about 6 different colors and have crazy fun with it, and I don't even do any of the super-creative stuff that's possible with it. Bree - U.S. mailing rates depend on both size and weight (and possibly other weird factors like shape). You can always be absolutely certain of the required postage by taking it to a post office, but I know the rules pretty darn well and calculate weight with my own hand-held postal scale. I just added this Calculate postage link to my resources sidebar; from there you choose domestic/international, then size and weight. If what you are mailing is simply an international letter (and a single sheet of stationery inside a fairly regular-sized envelope should fall into that category), then it's currently 98 cents. 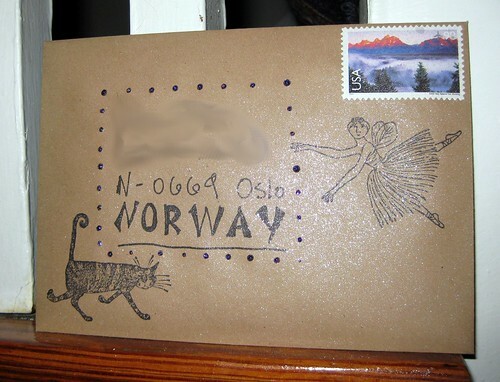 You can see the 98-cent international airmail rate stamp on the envelope in this photo. That rate is good for all international countries EXCEPT that it's slightly cheaper for Canada (75 cents) and Mexico (79 cents). The international letter rates, just like domestic first-class rates, are valid up to one ounce. Do not use forever stamps. They are abominable. If forever stamps are the only postage you have, you poor stamp-impoverished soul, then two of them should probably get your letter to Australia. 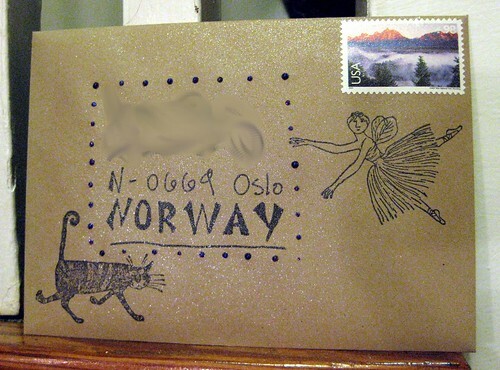 that envelope is fantastic! i'm a sucker for glitter, but paired with gorey, and you have my heart! that is just awesome and neat too . That is AWESOME!!! Lurve brown paper, Glitter and Gorey!!!! I jus' gotta get those stamps! Where did you get 'em ? Clemmie - I picked up the Gorey stamps on eBay.